The Type 8 provided heights by the beam splitting technique but a Type 13 was later installed for height finding. In 1945 a Type 21 centrimetric radar was also in use and the station belonged to the Nether Wallop Sector Control, its parent station being Tangmere." The mode of operation was thus. Targets indentified by the various CH stations were 'filtered' and the location of suitable enemy subjects passed to a 'Sector Control'. They handed on the target's range and bearing to the GCI station most likely to be able to detect it. That station then located the target on its own radar and called up a defending aircraft directly on the newly invented and highly effective two-way VHF radio. As the GCI could also observe the fighter on the same PPI monitor the Controller could direct the fighter to the target. Several fighters were allocated to work with each GCI station and often one would already be in the air close by in anticipation of business. 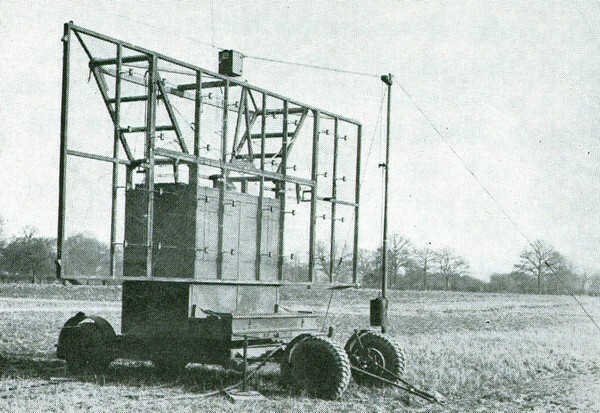 Some of our two-man nightfighters were equipped with their own short range radar so that they could conclude the interception, but in the early days such radar was far from perfect, being greatly affected by echoes from the ground. The station's Type 8 radar could rotate through 360 degrees but did not turn continuously as it was 'powered' by two men operating a bicycle type drive mechanism within the cabin, and directed by the controller they could halt the cabin on the bearing of the target. Furthermore, as the automatic transmit/receive switch had yet to be invented, an additional receiving Type 8 unit was required, and the two units had to be kept exactly aligned on the same bearing and that was difficult in any worthwhile breeze. A GCI station operated on a 24 hour basis apart from a one hour maintenance period. Due to mounting losses the Germans sought out the locations of the GCI stations and by monitoring the transmissions they discovered by their regular hourly breaks when these maintenance sessions took place. 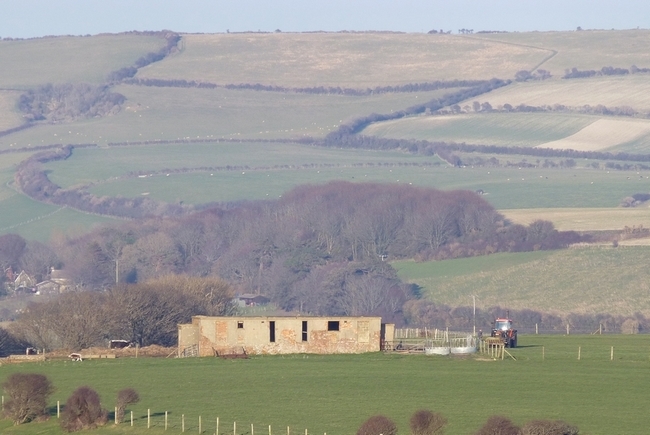 On the first of June 1943 Blackgang was attacked during the maintenance period but the bombs were aimed at the nearby buildings in Niton and not at the equipment on the clifftop. Three Trinity House lighthouse keepers were killed and also two soldiers. 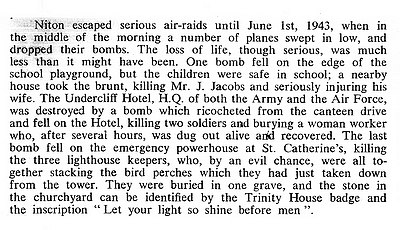 All the RAF personnel were billeted in Niton and Sheila Barnard an LACW WAAF who was just leaving The Buddle Inn was, incredible though it sounds, brushed aside and knocked over by a horiziontally moving bomb suffering no worse than a severely fractured arm, the bomb exploding 200 yards further on. This extract from a booklet produced by the Niton Womens Institute in 1971 records the sad event. The view below is looking inland from the coastal path. Niton village lies behind the trees. The site is a half mile from the sea above St.Catherines and is 470 feet above sea level. The map reference is SZ505766 and the site may be reached by a short footpath (NT33) to the south from the Military Road at the extreme westerly edge of Niton by the speed restriction sign.